Is Barack Obama really Irish? President Obama’s whirlwind trip to Ireland last week created all sorts of goodwill, with commentators believing that positive ripples will be felt in politics, tourism, the cultural industry and more. Then, all of a sudden, people weren’t feeling so happy and peppy. “We were just useful props in president's whirlwind electioneering roadshow,” an online headline in the Irish Independent read. What? Say it ain’t so! You don’t think Barack Obama -- in the end, a Chicago -- – would have certain political realities in mind when he takes a trip halfway around the world, do you? The basic argument of Obama’s critics -- or critics of the people who loved the positive vibe of the trip -- is that he played to certain stage Irish stereotypes in order to line up Irish American/Catholic votes in 2012. That line of thinking made it over to the U.S., where righter than-right Rush Limbaugh also questioned Obama’s motives. 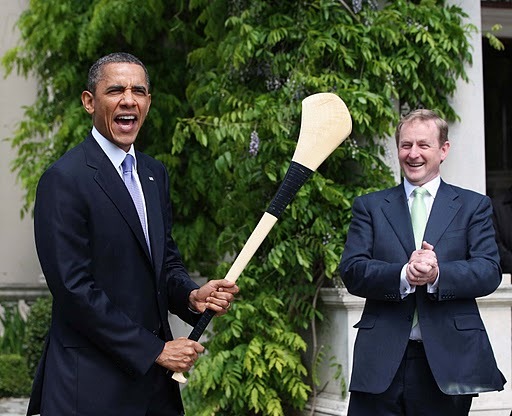 “We ought to start calling him Paddy Obama -- p-a-d-d-y, Paddy Obama, the Obama of Moneygall,” Limbaugh said. “But even the U.K. Telegraph today has a fabulous story about how ridiculous it is Obama is trying to pass himself off as an Irish guy. And when he goes to Africa, he tries to pass himself off as a Kenyan. All of this just makes you shake your head. Probably the most disturbing aspect of this is the suggestion by the likes of Limbaugh, but also Oddie and Hunt, is that Obama isn’t a “real” Irish American, or that he exploited his meager Irish American roots for maximum political gain. Obama can’t catch a break. He’s not a real American, he’s not a real Irishman, he, apparently, is not a real anything! Let’s be honest here. It’s as if a guy with roots in Africa also can’t have “real” roots in Ireland. But don’t forget, it’s not as if JFK’s dad was right off of the boat. If the diaspora has taught us anything it’s that -- like it or not -- our definition of what it means to be Irish American is ever-changing. Indeed, at the heart of all of this is the deep question -- what does it mean to be Irish? I slightly understand what Oddie is saying, in the sense that when most people talk about the Irish in America, they refer to Catholics in Boston or Brooklyn. That said, Oddie’s statement is patently false. As for there being no Irish vote in the U.S., again, it is true the days of Tammany Hall are gone. And yet, there’s no denying that the Catholic vote is at least significant. And, this being America, of course the number of 100% Irish fourth generation Americans is small. But being Irish -- just as it is for Obama -- is an important part of their heritage. To deny that is to play a really tricky game about who is “allowed” to be Irish and who is not. In the end, I can almost guarantee Obama is at least as Irish as a good chuck of the folks who, “overblown” as it may be, line Fifth Avenue every March 17. Can Obama call himself Irish? Yes he can!